Is Xerox's Silver Ink Ready to Print Circuits? Is Xerox’s Silver Ink Ready to Print Circuits? 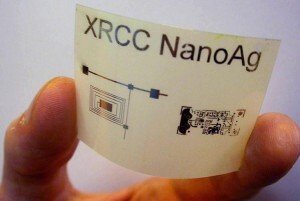 Xerox's new silver ink can be printed onto plastic or fabric to create ultrathin circuits. What’s the most powerful sentence in the English language? “Press ctrl-p to print.” Xerox (NYSE: XRX) has announced its development of special silver inks which have a melting point below that of plastic. Crafted into different versions which can act as conductors, semiconductors, or dielectrics, this silver ink could allow users to print integrated circuits onto plastic, fabric, or film. Thin and flexible, this technology may be the key to paper-thin solar cells, adaptable sensors, and many other sought after devices. Is Xerox poised to revolutionize the use of integrated circuits, or will this new ink be like so many other printable circuit systems of the past: amazing but never quite reaching market? If we could have printable circuits, what would that mean for the average consumer? Imagine buying a roll of fabric that was also a solar cell surface. Spread like a tarp it could provide portable energy almost anywhere in the world. Painted on a surface it could help power cars or buildings. Thin flexible circuits on plastic could become fantastic electronic readers, endless books available in an object that looks like a sheet of paper. Patients could have sensors embedded in the bandages in which they are wrapped. RFIDs could be built into any sheet of film. Every surface or piece of clothing could be alive with computing power. As hyperbolic as it sounds, printable circuitry allows for almost any such idea you want to dream up to at least be possible. The quest to produce printable electronics has been attempted by many different companies without a clear winner yet to be announced. Hewlett Packard used metal salts and water in an inkjet printer to create a printable liquid that dried into a conductive surface. That project is still being refined. A group of researchers at Merck, PARC (a Xerox company), and Stanford developed organic polymers with conductive properties that could be applied like ink. Again, that technology and related work is still in development. Shapeways recently debuted a stainless steel material which is the first such conducting medium in 3D printing. So where are all the paper thin e-books, the smart bandages, the clothing that computes? Like Track and Field at the Olympics after a hurricane, the path to printable circuits is littered with hurdles. First, you have to print not just conductors, but also semiconductors, and dielectric mediums. You have to overcome the increased electrical resistance inherent in any ultrathin conductor. You have to get the conducting medium to bend easily but not break. Everything has to print easily, accurately, and precisely enough to build reliable circuits. The list goes on and on. And it’s all got to be cheap and relatively simple to use. Xerox has cleared many of these hurdles. Silver is already one of the best conductors humans have, and this new silver ink has been adapted to provide even less electrical resistance. Variations on the formation of the silver reportedly allow Xerox to print conductors, semiconductors, and dielectrics. Insulation would come from the background medium of plastic or fabric. Most impressively, the new ink melts around 140°C, less than the 150°C for many industrial plastics. This means that the ink can be melted and applied without deforming the base material. Xerox is already soliciting development partnerships from other corporations. Interested businesses can apply to Xerox for samples of the new product. All of these are great accomplishments, but I fear that while Xerox may have more potential than many competing projects, it is still a long ways from actualization. When they present not just a new material and method of printing, but a printing system that can be mass produced, then I will be ready to declare an Epic Win in their favor. Until then, I will be dreaming up new inventions based on thin-film circuits. Best to be ready for what might be one of the most powerful technologies of the 21st century.